John was born in Creston, Iowa on December 29, 1954. He’s the son of the late optometrist, Dr. Jack Robinson and the late Helen Sloan. Both parents, through music, had a strong effect on John. He started on piano at the age of 5 and on drums at the age of 8. John turned pro when he started his first band at the young age of 10. John received the Arion Award in high school for most outstanding musician. After attending many music camps throughout junior and senior high school, John chose to attend Berklee College of Music in Boston. At Berklee, John was introduced to a whole world variety of culture through music. While touring with his own band in early 1978, John got his break. Rufus and Chaka Khan came into the club where John was playing and by the third set, the band ‘Rufus’ was sitting in with John! Within a few weeks later, John had moved to Los Angeles to finish the 1978 Rufus world tour! In late 1978, John was introduced to Quincy Jones. “Q” asked John if he did sessions outside Rufus. Of course he said “yes” and John was in the studio recording ‘Off The Wall’ for Michael Jackson. Ever since that record, “JR’s” phone has been ringing ‘off the wall’! 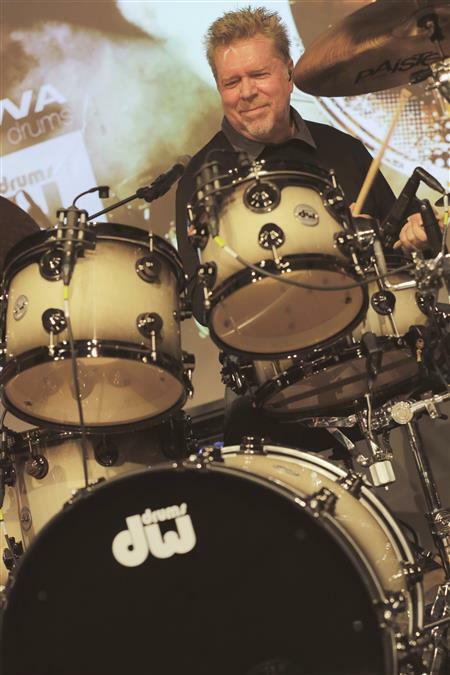 JR has become the most recorded drummer in history, even surpassing the great Hal Blaine. Some of the hits are, We Are The World, All Night Long, You Are and Say You Say Me by Lionel Richie, I’m So Excited and Slow Hand by the Pointer Sisters, I’m Just A Gigolo and California Girls by David Lee Roth, Higher Love, The Finer Things and Back In The Highlife by Steve Winwood, Express Yourself by Madonna, Off The Wall, Don’t Stop Til You Get Enough, Rock With You, The Way You Make Me Feel, Smooth Criminal, Workin Day and Night and Bad from the late great Michael Jackson, Natalie Cole’s,”Stardust” and Change The World by Eric Clapton, Quincy Jones’ The Dude, Q’s Jook Joint and From Q With Love, Give Me The Night from George Benson, Daft Punk’s “Random Access Memories”, Seal’s Crazy, The Brothers Johnson Stomp, Toby Keith I Wanna Talk About You, Whiitney Houston’s Greatest Love Of All, Saving All My Love, Didn’t We Almost Have It All & I Will Always Love You and Rod Stewart’s Rhythm Of Your Heart, just to name a few. JR also played drums for the Quincy Jones Live at Montreux and David Foster and Friends, “Hitman” & “The Hitman Returns”. Of course in the 1983, JR won a Grammy with Rufus and Chaka Khan for “Ain’t Nobody” from Stompin At The Savoy. John has been the the drummer for Quincy Jones since 1979 and the drummer for Barbra Streisand from 1993 through the present. JR has also been the drummer for the Oscars multiple times. JR has also played on a number of motion pictures including, My Cousin Vinny, Grand Canyon, Pure Country, Phenomenon, The Body Guard, First Wives Club, Celtic Pride, Dave, Denise The Menace, Evening Star, Father’s Day, Free Willy, Hercules, How Stella Got Her Groove Back, Independence Day, Jerry McGuire, The Mirror Has Two Faces, Little Rascals, Nothing To Lose, Nutty Professor, The Preacher’s Wife, Quest For Camelot, South Park, Space Jam, Tin Cup, The Waterboy, Dinosaur, America’s Sweethearts, Rush Hour 2, That Thing That You Do, Pirates of the Caribbean [Dead Man’s Chest], Hairspray, Frasier Theme, Fever Pitch, Anchorman, Austin Powers in Goldmember, Dodgeball, Garfield, My Cousin Vinny, What Happens In Vegas, You Me & Dupree, Drillbit Taylor, Marley & Me, 27 Dresses, Tropic Thunder, Yes Man, Year One, I Love You Man, License To Wed, The Hangover, The Hangover 2 and The Hangover 3 , Larry Crowne, Tower Heist, The Green Lantern, R.I.P.D., Man Of Steel, The Finest Hours and Batman vs.Superman. John has two solo CD’s called, “Funkshui” and “Platinum” out on his own label, Homecourt Records and another CD called “Rivers Of Paradise” with his band TRW released through Frontiers Records. JR also has a band called Native Son with band members Michael Thompson, Bobby Watson and Mo Pleasure with a new CD, “Son Talk” released 2011 on King Records. His educational DVD ,“Time Machine” for The Drum Channel was released August 1, 2011. “Time Machine” won DVD of the Year by Modern Drummer Magazine. John has been touring with the great David Foster and Friends since 2010 and is on The Hitman 1 & The Hitman Returns. He is also touring with Barbra Streisand and legend Quincy Jones. JR is producing multiple projects and maintains a recording studio in Thousand Oaks, CA. JR has just finished producing Null Paradox “Love Or Destiny” released 2/14/2017. JR will continue to add his magic on many hits, movies and jingles to come with his recognized sound employing great time, great songs and a great groove.